BELLVILLE — Supporters of Clear Fork Local Schools have kicked off a campaign to put all-weather turf on the football/soccer field at the high school. The Clear Fork Athletic Boosters Club — in a collaborative effort with the athletics department — announces the “official” launch of a capital campaign to raise funds to install synthetic turf on the field at the Colt Corral. The estimated cost of the project is $900,000. A company to provide the turn and the exact kind of turf has not yet been determined. The plan is for installation to start in May and for the field to be completed before the fall sports season begins. There will be numerous ways for business and individuals to donate. Donations will tax-deductible. Other area schools with artificial turf include Madison, Mansfield Senior, Highland, Mount Vernon, Wooster and Marion Harding. The idea to install turf at Clear Fork first arose in 2011 and some initial inquiries were made, but the project never moved forward. The topic has been brought up on several occasions since, but this past summer conversation began again in earnest and a committee was formed, with Laux taking the lead. 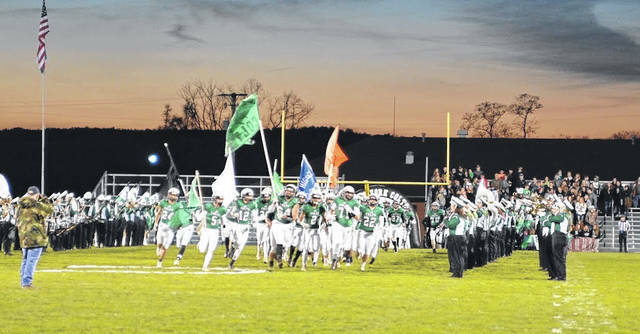 Clear Fork’s football teams have enjoyed unparalleled success in recent years, qualifying for the state playoffs the past two years and winning two Mid-Ohio Athletic Conference football championships. The girls high school soccer team has a long history of success, including being one of the top teams in the state the past several seasons. The committee consulted with a couple different turf companies and received initial quotes for the job. Laux added that with the improvements in turf technology and installation, it will also be more cost efficient over the long haul with maintenance, and it will be worth the initial financial investment. “We made a “soft” introduction of the project at the fall sports parents meeting in July and set out garnering support through corporate sponsorships,” Laux said. “We are excited to announce that we have over $600,000 in pledges to date with more coming in. And now, supporters are going public with their fund-raising efforts. Initial quotes for the project came in at about $900,000. This includes installing a shock pad under the turf that will provide greater safety for our students and give the surface a more “natural” feel. The plan is for installation is begin in May and will be completed by early August, before the fall sports seasons begins. There are various ways to donate and an “Every Door Direct Mailing” will soon take place. Payment can be made by cash, check, credit card or Paypal annually, quarterly or monthly,based on your pledge options. If you want to send in a payment, make your check payable to CFAB and mail it to P.O. Box 657, Bellville OH 44813. For more information, you can contact Laux at 419-564-8900 or lauxcolt@aol.com. Arrangements can be made for Laux or others to come to your club or civic group to talk personally about the project.